Toss the baby arugula with Dijon mustard, salt and pepper. Set aside. Heat a large sauté pan with butter. Generously butter all 8 slices of bread on one side only. Begin to assemble the sandwich by placing 2 slices of bread in the pan, butter side down. 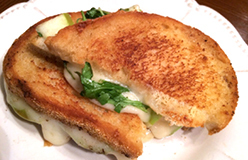 Layer on to the bread - half the apple slices, half the cheese and half of the arugula. Top with two slices of bread, buttered side up. Cook the sandwich until toasted on both sides and cheese is melted. Repeat the process for the last two sandwiches.